Trickling into Terra from an evening of karaoke, voices slightly hoarse, heads foggy from a slumber cut short by default – its been a while since I’ve exhausted myself till 2 am. We’d been imbibing the night before, yet we perked up when we learned that brunch includes three glasses of your choice; champagne or mimosas. Boozy brunches are what Sundays are made for (and rest, which we did plenty of after leaving the restaurant full and satisfied). Roll your eyes if you must; maybe even mutter an exasperated, “Millennials,” as you breeze through the first paragraph. But indulge me, and i’ll give you something even better to roll your eyes at. Sunday Brunch at Terra American Bistro, La Mesa. Aside from the requisite libations, Terra offers hearty portions without sacrificing quality and taste, friendly and attentive service and a cozy atmosphere perfect for lingering. Among our table of seven, one particular dish stood out. Terra’s Stuffed French Toast, ordered by my petite friend and Personal Trainer Erica, was devoured and enjoyed by everyone who managed to get a forkful (or three) in. The restaurant menu describes the dish featuring a cinnamon and corn flake crust, with persimmon and cream cheese and topped with bourbon butterscotch. In other words, that french toast is so damn delicious. Like, your eyes will roll to the back of your head delicious. The toast itself is saturated enough without becoming too soggy, while the slight tartness of the strawberries, stuffed between the two thick slices of toast balance out the sweetness of the cream cheese and butterscotch. While the exterior of the restaurant may need some sprucing up, don’t let its odd location and outdated logo deter you. The good stuff is inside. 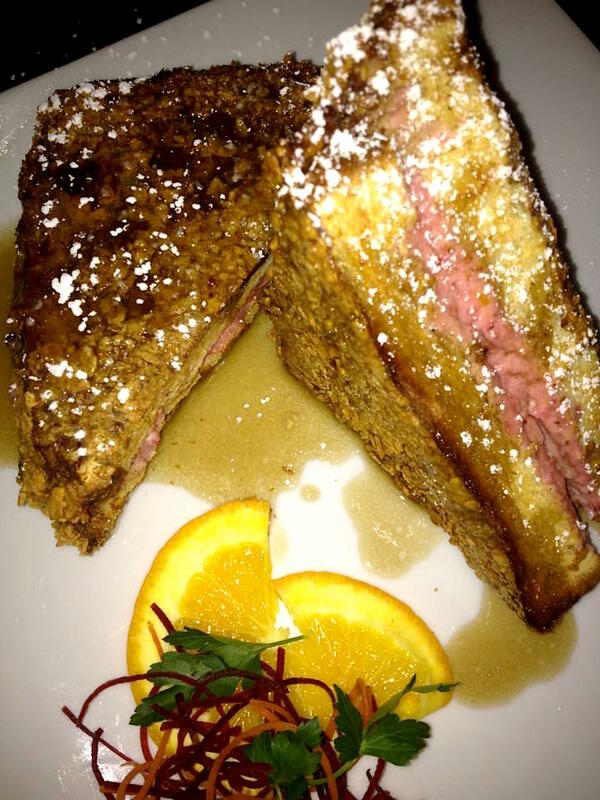 Terra’s Stuffed French Toast. PC: Terra’s. Tip: Sit at the communal table if you feel inclined to meeting and clinking champagne glasses with new people. We did, though we had no choice walking in without a reservation. I recommend calling ahead if you have a party of four or more. Brunch (and mimosas!) is served every Sunday from 9 am – 2 pm at Terra, located on El Cajon Blvd. in La Mesa. 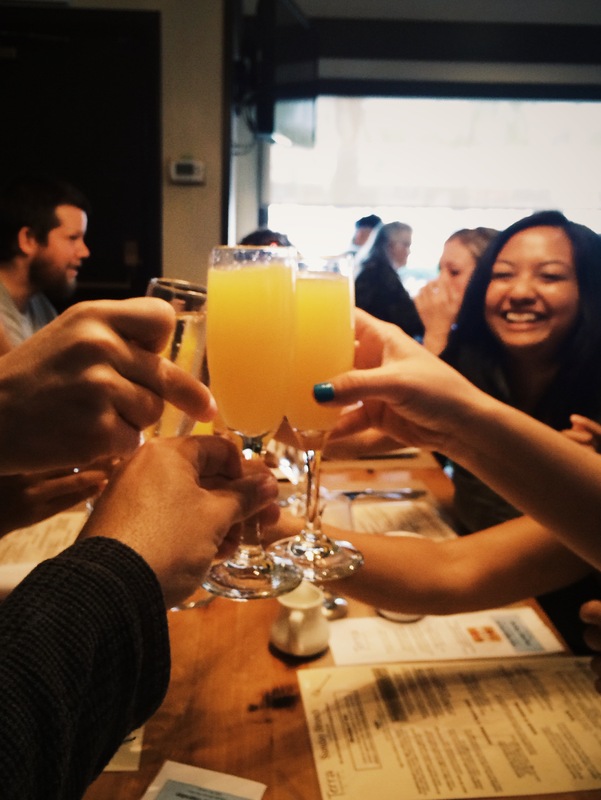 Interested in more San Diego brunch ideas? Check out this post for my go-to spots. If you’re in Santa Barbara, check out this gem.